1) Surveyors around the world are struggling with many current challenges. However, this article gives you a possibility to reflect about the impact of surveyors through history in the development and mapping of societies. This paper is a historical outline of the early land surveyors importance to the history of New Zealand, as they were among the advance guard of European settlers to walk the land and assess its potential for future development. Surveyors around the world are struggling with many current challenges. However, this article gives you a possibility to reflect about the impact of surveyors through history in the development and mapping of societies. The paper is a historical outline of the early land surveyors importance to the history of New Zealand, as they were among the advance guard of European settlers to walk the land and assess its potential for future development. We are pleased to share this paper with you since FIG Institution for the History of Surveying and Measurement organises a very special trip, conference and event on Charting and Mapping the Pacific Paradise of the Pitcairners at Norfolk Island, (an island half way between Australia and New Zealand), 6-10 July 2014: Invitation and program. A version of this paper was presented to Celebrating the Past - Redefining the Future, New Zealand Institute of Surveyors Conference, University of Otago, Dunedin, New Zealand, 27-30 August 2013. In addition, much of this essay is drawn from Giselle Byrnes, Boundary Markers: Land Surveying and the Colonisation of New Zealand, Bridget Williams Books, Wellington, 2001; see also G. Byrnes, ‘Surveying—Maori and the Land: An Essay in Historical Representation’, New Zealand Journal of History, vol. 31, no. 1 (1997), pp. 85-98. See also Giselle Byrnes, ‘Boundary Makers: Land Surveying in 19th Century New Zealand’ in Mick Strack, ed., Survey Marks: A 2013 Celebration, School of Surveying and the New Zealand Institute of Surveyor, Dunedin, 2013, pp. 7-16. Land surveyors in nineteenth-century colonial New Zealand were located, quite literally, at the ‘cutting edge’ of the great British imperial project to claim and tame new territories. The early land surveyors were important actors in this country’s history as they were among the advance guard of European settlers to walk the land and assess its potential for future development. Indeed, the landscape of modern New Zealand testifies to their work through the place-names they assigned and which are still visible on the map. Moreover, most colonial land surveyors were aware that they were not ‘first-time explorers’, but were traversing landscapes that were already known, named and mapped by the indigenous Maori. In the early period of organised British settlement, from the 1840s to the 1860s, the land surveyors’ efforts to claim the land were, therefore, much less an exercise in possessing the land outright than they were translating the meaning of land from one cultural framework into another. From the 1860s, however, and especially with the aggressive activities of the Native Land Court from 1865, the work of the colonial land surveyors took on a more potent role as Maori land was permanently transitioned from customary tenure to Crown-derived titles and subsequent private ownership. This essay briefly considers the colonising efforts of the early colonial land surveyors in New Zealand during the second half of the nineteenth-century following the assertion of British sovereignty 1840 and their negotiation of both the cultural and physical boundaries they encountered during the conduct of laying out the land for future settlement. NEW ZEALAND, an isolated archipelago located some 1500km east of Australia in the south-west Pacific, was one of the last substantial landmasses to be settled by humans. While the Polynesian ancestors of the indigenous Maori people arrived on the North and South Islands over 1000 years ago, the European settlement of New Zealand occurred much later. Although there was intermittent contact and trade between Europeans and Maori from the late eighteenth century, it was not until the 1830s that the British began to assert their presence in New Zealand, mainly through missionary efforts to ‘convert’ Maori to Christianity, led by the London-based Church Missionary Society. In February 1840 the Treaty of Waitangi was signed between the British Crown and Maori tribes whereby, and despite serious ambiguities between the intent and meaning of the Maori and English language versions of the Treaty, the British assumed sovereignty over the country and declared New Zealand a Crown colony. Massive British and European immigration immediately ensued and within a decade war over land and issues of sovereignty broke out. For much of the remainder of the nineteenth century, the colony of New Zealand was a war-zone with British colonial forces embroiled in a bitter contest with indigenous Maori for control of large parts of the country. Eventually, the British declared themselves victorious and as punishment, much of the remaining land occupied by Maori tribes was confiscated, following punitive models that had been applied by the British in subduing the ‘rebel’ Irish clans in the seventeenth century. In addition, successive New Zealand colonial governments worked to redefine, control and ultimately transform the meaning as well as the ownership of Maori land through a series of complex legislative instruments. In this way, almost all of the Maori land estate had passed out of indigenous hands by the early years of the twentieth century. Today, just a small fraction of the original Maori estate remains in Maori ownership (1). The colonial land surveyors were critical to this history of contest and transformation. Located among the vanguard of European settlers to New Zealand, land surveyors were charged with creating new outposts of empire that would replicate the values, attitudes, and aspirations of the Old World. Moreover, the work of the land surveyors reflects much that is central to the European history of New Zealand, particularly the transformation, domestication and ‘taming’ of the natural environment. Physically located on the margins of settler society, the land surveyors occupied a central role in implementing colonisation on the ground. They were therefore both boundary markers as well as boundary makers. The task of the colonial land surveyor was a significant one. Charged with reining in the wilderness and creating order and sense in ‘uncharted’ territory, the land surveyors occupied a peculiar position in the practical implementation of colonial policy. The lines inscribed by the land surveyors—in maps, drawings and plans as well as on the land itself—were symbols of power and portents of the political, social and economic change that was to follow in their wake. In this way, land surveying was fundamental to the British acquisition of new territory, and represented, in a very graphic and visible way, the thrust of the broader colonial project. Land surveying in colonial New Zealand had its genesis of course in a much older tradition. In the eighteenth and nineteenth centuries, the expansion of empires, along with the consequent need to delineate national boundaries and construct maps of territorial possession, demanded increasingly accurate methods of land demarcation and measurement. In addition, the process of enclosure and the increasing value of private property in rapidly developing urban centres brought surveying and surveyors into the economic as well as the political arena. By the middle of the nineteenth century, in Europe at least, land survey methods comprised a combination of perspectives and competing practices. While the influence of military techniques (inherited from the Roman architects of land surveying) remained strong, this was accompanied in the latter half of the nineteenth century by a new emphasis on scientific engineering as a direct consequence of British industrialisation. Broadly speaking, land surveys in colonial contexts fell into two categories. The first involved confirming an already existing cadastre and provided a retrospective vision of land already settled; this was the case where the settlement patterns had long been shaped by history and tradition. The second was concerned with the future rather than the past; focussed on providing a framework for future resettlement. This latter method, what might be termed the 'survey of the future', was enthusiastically adopted in New Zealand, where the land surveyor's chief task was to layer a new spatial order on the existing landscape. Within this ‘future’ survey, there were two forms: those where the free selection of land parcels had commenced prior to actual settlement and those where settlement was consciously planned in advance. The 'free selection survey' was the most frequent type of survey in colonial New Zealand, at least in the early years of organised settlement. This allowed individuals to determine the boundaries of their own allotment and frequently led to irregular and odd-shaped parcels of land (along with the consequent administrative confusion). On the other hand, surveyors who determined the shape of sections in advance of formal occupation usually laid out a planned settlement for clients such as individual landowners, a company or the government. Free selection prior to survey can still be seen in the design of many rural sections, while the New Zealand Company settlements (the New Zealand city of New Plymouth, for example) are perhaps the best examples of the planned settlement surveys. In their work, New Zealand colonial land surveyors employed instruments which were common to surveying practice elsewhere, including the theodolite, the circumferentor or surveyors’ compass, and the prismatic compass (2). Francis Edward Nairn, ‘Mr Mantell at Moeraki ’, ink on sketchbook. E333-084-3, Alexander Turnbull Library, National Library of New Zealand/Te Puna Matarauranga o Aotearoa. So who were these men and how might they best be described? The land surveyors in colonial New Zealand worked in a number of different capacities. From 1854 surveyors were included on the staff of the Land Purchase Department (incorporated into the Native Department in 1885), established to manage the acquisition of Maori land. Until 1862 it was possible to obtain work as a land surveyor without registration, although surveyors under contract to the Crown to survey Crown lands (and so-called ‘waste lands’) were required to satisfy the standards set by the provincial chief surveyors. In the absence of a standardised system of registration, any person with a minimum knowledge of surveying could practice with minimal experience or qualifications. Consequently, many young men turned to surveying as a relatively easy source of income and adventure. Following the signing of the Treaty of Waitangi and the assumption of British sovereignty, increasing numbers of British settlers arrived in New Zealand. With expectations about the superior quality and potential of the land, the pressure for land quickly intensified and the demand for surveyors consequently grew. During the 1840s, tension between the nascent colonial government and the New Zealand Company over disparate land policies, together with the demands of Company settlers, who felt cheated of their purchases, stretched the existing resources of both the New Zealand Company and Crown survey services. Sons of missionaries and traders, many of whom were educated in mission schools and were fluent in the Maori language, were readily recruited as surveyors. It is worth noting that their intimate knowledge of Maori culture and language proved invaluable not only in negotiating the survey, but also in facilitating the purchase of much of the Maori land estate. With the further influx of settlers in the 1850s and 1860s, the colonial government increasingly looked to the immigrant population for additional survey staff. Most but by no means all of the early surveyors were born in England and made New Zealand their adoptive home. Some came from Scotland and Ireland, while others came from further afield, particularly central Europe. A large number of land surveyors had spent time in the Australian colonies before arriving in New Zealand; indeed, most of the early surveyors who have left records had travelled extensively before arriving in the colony. Some had left established careers to immigrate and brought experience with them, while others were young men who chose to ‘cut their teeth’ in developing a surveying career in New Zealand. Robert Park and John Rochfort, for instance, were trained in engineering; Charles Heaphy initially trained as a draughtsman; and Theophilus Heale, later chief surveyor and inspector of surveys, was educated as a classical scholar, mathematician and navigator. Some—Charles Heaphy, Samuel Brees and John Buchanan, for instance—were highly accomplished artists, while others had trained as draughtsmen and drew on these technical skills in the course of their surveying fieldwork. Others became active in political roles, at both the provincial and national level. Frederick Carrington, for example, was a provincial superintendent and a Member of the New Zealand Parliament. Land surveying was often a natural choice of occupation for those young male settlers who could make use of their skills in a particularly practical fashion. In addition, the colonial land surveyors were often men of learning and intellectual ability, with interests in poetry, ethnology, philology and geology. It would be fair to say too that land surveying, due to its physical rigors, typically attracted young men with a keen sense of adventure and an abundance of energy. For many young men, a surveying career also promised the challenge of working on the colonial frontier (3). The everyday reality for the colonial land surveyor was clearly challenging and probably sat somewhere between these highly romanticised images. The rain, 'the bog' and the inclement weather elicited frequent comments and complaints. Generally, the climatic challenges, while inconvenient, were seen as a test of strength and fortitude. 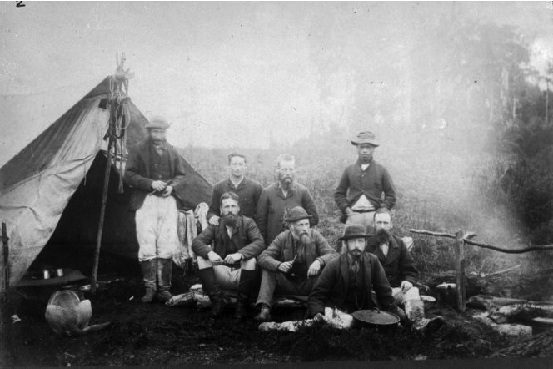 'The [New Zealand] Company's surveyors whose life is almost wholly spent in the bush,' Charles Heaphy remarked in 1842, 'and who often pursue their vocation in all weathers, are amongst the healthiest and most robust men in the colony.' (6) They had to be able-bodied and strong, as living arrangements were often makeshift, temporary and haphazard, and often fraught with risk. Despite the aggressive pace of the British colonisation of New Zealand post-1840, most of the early colonial land surveyors were keenly aware that they were not ‘first-time’ explorers, but were traversing landscapes that were already known, named and mapped by indigenous Maori. Certainly, from the 1840s through to the 1860s the land surveyors’ efforts to name, tame and claim the land were much less an exercise in possessing it outright and more about transitioning the meaning of land (its value, attributes and qualities) from one cultural framework to another. From the 1860s, and especially with the operation of the Native Land Court from 1865 onwards, the work of land surveyors took on a more formidable role as Maori land was transferred from collective customary tenure to individual Crown-derived titles and, in many cases, was permanently alienated. This meant that land surveyors were in frequent contact and negotiation with resident Maori communities; indeed, for many communities, the land surveyor was the ‘face’ of the new colonial order. Maori responded to the increased demand for their services from the land surveyors by adapting and expanding their existing economic networks. Arthur Dobson, for instance, wrote that on the West Coast of the South Island, 'as time went on able-bodied young men that I had working for me sent word to the various pas (Maori village settlements) down the coast that I was coming, and that I would pay for help for canoeing on the rivers'. (8) When Dobson arrived to commence his survey, members of the local tribe Ngai Tahu, were ready and waiting for business. The negotiation of this sort of boundary making eventually cut both ways, however, and Maori opposition to surveying was not uncommon as lines were drawn, often arbitrarily, through cultivations and across tribal boundaries. Indeed, from the 1860s onwards, for many Maori communities the presence of the land surveyor became a metaphor for loss and a portent of impending land alienation. According to land surveyors who worked in Taranaki [in the southern North Island], Maori frequently (and publicly) demonstrated their opposition to the conduct of land surveys. While laying out the settlement of New Plymouth, a New Zealand Company settlement in the lower North Island Taranaki region during the early months of 1841, Frederick Carrington was confronted by 'natives from the interior who said we that we should not cut any more. They flourished their tomahawks, and danced and yelled, and I thought we should all be massacred. '(10) In Taranaki, this reaction was not surprising, given that many of the purchases were highly contested, both at the time, and later, in the form of submissions to successive government commissions of inquiry. Tensions between the Ngati Toa tribe and the New Zealand Company land surveyors working at Wairau, near Nelson in the north of the South Island, reached a climax in June 1843, when 22 settlers and six Maori were killed. The incident followed an attempt by officials of the New Zealand Company in Nelson to seize by force land from the great rangatira (chief) Te Rauparaha, who denied having sold the land. For Maori, the surveyor's theodolite—commonly referred to as the 'taipo' or 'tipo'—was also a symbol of uncertainty and possible conflict. From the 1840s, the erection of survey poles, like the traditional pou whenua marker-poles of Maori society, signified an explicit and aggressive act of possession. Maori leaders therefore often regarded the intrusion of the surveyors and their boundary markers as overt challenges to their mana. While surveying Ngai Tahu land reserves in the South Island in September 1848, the surveyor Walter Mantell noted how '[t]wo or three old men not understanding the erection of a pole at their huts at Waitueri threw it away with the others which the man carried. I went down [and] lectured them [and] explained the use of the pole and remained there. '(11) There is much evidence to suggest that Maori well understood the erection of the survey poles, and their removal was a deliberate act of protest at Mantell's marking out of the reserves. The surveyor Edwin Brookes cited the suspicion Taranaki Maori held towards the theodolite in the 1870s: 'The invariable expression that would come over them after a long drawn breath was "taipo", meaning evil spirit: by my interpretation was—a mystery, or something mysterious. In order to show them a friendly spirit, I would allow many of these natives to look through the telescope, when they would withdraw from it much perplexed. '(12) While impressed by the technology, Maori no doubt appreciated the powerful role of the theodolite in the survey and alienation of their lands. These examples of conflict serve both to illustrate the precarious position occupied by the early land surveyors working in the field and highlight how an indigenous Maori system of naming and mapping pre-dated and indeed co-existed with the new order imposed by the colonial land surveyors. For Maori, boundaries on the land formed the basis of an indigenous system of mapping. As the basis of tribal economy and community life, land was identified through a complex system of rights and privileges that relied on physical as well as cultural boundary markers. While whakapapa (genealogical) connections, waiata (song), and 'mental maps' were used in navigating the land, boundaries were indicated by geographical features such as hills, rock formations and rivers. Stones, wooden posts and holes dug into the ground also functioned as markers between tribal areas, and individual cultivation plots were often the most enduring divisional marks. Maori also diverted streams and constructed estuarine canals to assist with fishing and to act as boundary markers. Prior to organised British settlement in the mid nineteenth century, there was little need to precisely delineate physical boundaries. From that point forward, however, boundaries on the land became symbols of identity, ‘ownership’ and esteem; established and legitimized in public and official discourse and given popular currency by government legislation. Western capitalist ideas of land tenure and individual property ownership then quickly dominated. The land wars, and their issue—the Native Land Courts and the raupatu—also played a role in this fundamental shift in thinking. While indigenous Maori perceptions of land use and ownership continued, European (and especially British) ideals about land usage and administration soon became the norm rather than the exception. Land surveying was fundamental to the British colonizing vision and the acquisition of new territories, such as New Zealand, for settlement. The work of the colonial land surveyors reflects much that is central to the history of New Zealand, particularly the transformation and domestication of the natural environment. The land surveyors were crucial in effecting change, as they occupied a central role in implementing the principles of colonization on the ground: they operated, quite literally, at the ‘cutting edge’ of colonization. Their work deserves, therefore, to be remembered, though it also needs to be understood in context. While it would be tempting to oversimplify the contribution of the land surveyors to New Zealand’s past, and (depending on your point of view) to either valorize or demonize their work as colonial entrepreneurs, it is worth remembering that the land surveyors were agents of their time who were capable of questioning the longer-term outcomes as well as the immediate impact of their work. We need to remember them as complex historical actors whose work has shaped the contours of our historical trajectory and fashioned our modern society in ways more powerful than we fully realize. Land alienation, in addition to a range of other issues, is the subject of the vast majority of claims by modern Maori to the Waitangi Tribunal, a commission of inquiry established in 1975 to inquire into the allegations by Maori tribes that the Crown has consistently failed to honor its responsibilities under the 1840 Treaty of Waitangi. See further, Claudia Orange, The Treaty of Waitangi, Allen and Unwin, Wellington, 1987; Alan Ward, An Unsettled History: Treaty Claims in New Zealand Today, Bridget Williams Books, Wellington, 1998; Giselle Byrnes, The Waitangi Tribunal and New Zealand History, Oxford University Press, Melbourne, 2004. 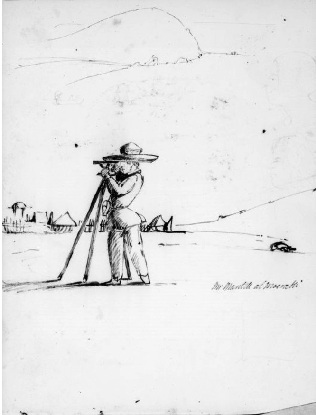 Surveying in North America embraced both types of survey, while in the Australian colonies, planned rectilinear (or equal square) land division was the most common practice. Chain surveying was also a common practice, where the Gunter’s chain, 66-foot long and divided into equal links, was used for calculating distance. John Rochfort, The Adventures of a Surveyor in New Zealand and the Australian Gold Diggings, London, 1853. Edward Jerningham Wakefield, Adventure in New Zealand, first edition John Murray (ed. ), London, 1845, revised edition Joan Stevens (ed. ), Auckland, 1975, pp. 233-34. John Turnbull Thomson, ‘Extracts from a journal kept during the reconnaissance survey of the southern districts of the province of Otago’, in Nancy Taylor (ed. ), Early Travellers in New Zealand, London, 1959, p. 347. See also John Turnbull Thomson, MS-Papers-0176, Alexander Turnbull Library, Wellington, and John Turnbull Thomson, Rambles with a Philosopher, Dunedin, 1867. Charles Heaphy, Narrative of a Residence in Various Parts of New Zealand, London, 1842, p. 23. Rochfort, The Adventures of a Surveyor; Jollie wrote 'this old Maori was named after Sir George Grey the Governor—twice—of New Zealand, by I believe, Mr Walter Mantel [sic].' Edward Jollie, Reminiscences 1825-94, MS-Papers-4207, Alexander Turnbull Library, Wellington, p. 27. Similarly, the wives of Kehu and Pikewate joined them in guiding Thomas Brunner down the West Coast of the South Island on his 'Great Journey' of discovery in 1846-48. Cited in Arthur Dudley Dobson, Reminiscences of Arthur Dudley Dobson, Engineer, 1840-1930, Christchurch, 1930. Henry Reynolds, 'The land, the explorers and the Aborigines', Historical Studies, vol. 19, no. 5 (1980), pp. 213-26; Paul Carter, The Road to Botany Bay: an essay in spatial history, London, 1987, p. 340. F. A. Carrington, cited in William H. J. Seffern, Chronicles of the Garden of New Zealand Known as Taranaki, New Plymouth, 1896, p. 47. Walter Mantell, 'Journal Kaiapoi to Otago, 1848-49', MS-Papers-1543, Alexander Turnbull Library, Wellington. Edwin Brookes, Frontier Life: Taranaki, New Zealand, Auckland, 1892, pp. 38-39. The confiscation of Maori land, or raupatu, was ushered in under the rather euphemistically titled ‘The New Zealand Settlements Act 1863’. As Nola Easdale has shown in New Zealand and Stephen Martin for Australia, surveyors’ diaries and field books are particularly rich historical sources. See further Nola Easdale, Kairuri, the measurer of land: the life of the nineteenth century surveyor pictured in his art and his writings, Highgate/Price Milburn, Petone, 1988; Stephen Martin, A New Land: European perceptions of Australia, 1788-1850, Allen & Unwin, St Leonards, New South Wales, 1993. Professor Giselle Byrnes is Pro Vice-Chancellor of the Faculty of Law, Education, Business and Arts at Charles Darwin University. Professor Byrnes moved to the Northern Territory from New Zealand in mid 2011 with her family to take up this role. She was formerly Professor of History and Pro Vice-Chancellor (Postgraduate) at the University of Waikato, Hamilton, New Zealand (2007-2011). Giselle Byrnes completed a PhD in History at the University of Auckland in the mid-1990s and then worked as an historian for the Waitangi Tribunal. She returned to academia in 1997 and taught in the Department of History at Victoria University of Wellington for a ten-year period (1997-2007). Here she established the Public History programme and developed a suite of courses in social and cultural history, with a particular emphasis on exploring history in colonial and postcolonial contexts. Professor Byrnes' publications include Boundary Markers: Land Surveying and the Colonisation of New Zealand (2001), The Waitangi Tribunal and New Zealand History (2004) and The New Oxford History of New Zealand (2009), for which she was Editor. She has also published numerous articles on various aspects of colonial, settler and Indigenous histories, in addition to public history. While the focus of her work has been grounded in New Zealand historical experiences, she has expertise in comparative colonial and transnational historical methodologies. In 2006 Giselle Byrnes was Fulbright Visiting Professor in New Zealand Studies at Georgetown University, Washington DC, and she has served a term as National President of the New Zealand Historical Association. Visit Norfolk Island and experience the historic site together with FIG International Institution for the History of Surveying and Measurement, who invites you to Charting and Mapping the Pacific Paradise of the Pitcairners Conference The conferences will be held at Norfolk Island, New Zealand, 6-10 July 2014.